Large areas of globally important tropical peatland in Southeast Asia are under threat from land clearance, degradation and fire jeopardising their natural functions as reservoirs of biodiversity, carbon stores and hydrological buffers. Local research capability will be strengthened enabling peatland managers to better understand and address the different, interrelated processes operating in tropical peatlands. 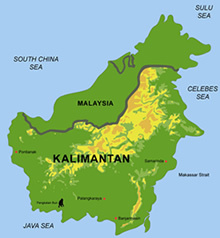 Prepare an inventory of peatlands in SE Asia with an accurate map of their location in Central Kalimantan. prepare a model environmental land use planning strategy that can be transferable elsewhere with peatland resources in the tropical zone. Detailed study design including rationale, approach and methodologies:Tropical peatlands are a major target for development although there are nodetailed accounts of its natural resource functions and values or plans for its sustainable management. Indonesia will be the principal focus for this research proposal since it has the largest area of tropical peatland in the world and is where most peatland development will take place over the next 20 years. The recent decision by the Government of the Republic of Indonesia to convert one million hectares of peatland in Central Kalimantan to rice padi makes this proposal even more relevant and urgent. Information from other countries in SE Asia, especially Malaysia and Thailand will also be incorporated. Detailed field research and environmental monitoring will be concentrated in this province which still has approximately 3 million hectares of peatland, much covered by tropical rain forest. The over riding rationale of this proposal is to undertake the first comprehensive evaluation (including biodiversity, ecological, environmental and socio-economic attributes) of tropical peatlands based upon studies at different spatial scales. At the largest scale, mapping will enable the role of undisturbed and developed tropical peat of Southeast Asia for carbon dioxide storage and emission to be determined. Medium scale approaches will focus on the Indonesian Province of Central Kalimantan (Borneo) whilst local studies will concentrate upon one peat-covered catchment within the latter. This scalar approach is essential in order to encompass the ecological heterogeneity and range of sector developments within tropical peatland systems. Data obtained in this study will be used to prepare guidelines for the sustainable management of tropical peatlands based upon a model ecohydrological catchment plan. The study design incorporates environmental audit and assessment, involving large scale survey and extensive ground checking. The current status of the peatland resource will be established and the impacts upon it determined, prior to preparing guidelines for its sustainable management. The large scale survey will apply sophisticated techniques of remote sensing, including the new Synthetic Aperture Radar (SAR) satellites ERS-1/2 (EU) and JERS-1 (Japan) that can penetrate the cloud which frequently covers this part of Kalimantan. The results of remotely sensed vegetation, peat and land use mapping will be linked to extensive field surveys, ecological studies and laboratory analyses. Natural, secondary, developed and degraded peat swamp forest (PSF) will be investigated. 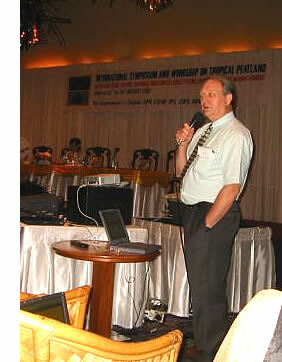 Species will be documented, compared and evaluated, together with determination of peatland area, peat thickness, geochemistry, hydrology and hydrochemistry, forest sub-types and structure, tree biomass and nutrient dynamics in order to understand the ecological processes and natural resource functions of tropical peatland and the impact of development upon these. Special emphasis will be placed upon the socio-economic values of both developed and undeveloped PSF and how these can be catered for within strategies for environmentally sustainable management. communications and networking between partners and associates (WP1000). of natural resource functions and impacts. (WP4000). with special responsibility for peatland forestry and carbon dynamics. field element of the research and much of the chemical analysis are provided. socio-economic values of tropical peatland. Expert knowledge of the biodiversity and ecology of tropical peatlands.